Recently I have been experimenting with new foundations. This little project originally started as a search for a good high street foundation so I could save my beloved Chanel Vitalumiere Aqua for special occasions. Then during the winter I started trying to find a higher coverage foundation to even out my blotchy winter skin tone and my search slowly crept higher up the price scale. There are great high street foundations but I haven't found one that performs as well as my favourite high end ones. So several months and many purchases later I have given them all a good trial and it is about time I gave you the low down on my findings! First off I should explain my criteria for what makes a good foundation. I prefer a natural look - not too matte or heavy like a mask. I also don't like the feeling of something sticky on my skin that is likely to transfer to anything touching my face during the day. I have combination skin - an oily nose but with dry patches on my forehead. I also have some redness that I like to disguise and of course those noticeable pores (see my earlier post about these HERE). I want something that is easy to apply, doesn't sit in under-eye creases and lasts pretty well throughout the day (I NEVER re-apply foundation during the day - life is too short!). 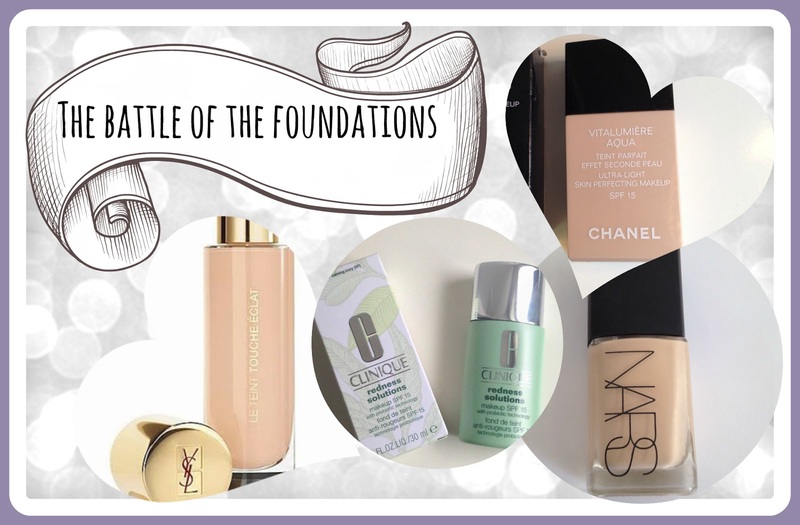 To make sure I compare like with like, the foundations that I have been trying are high-end (perhaps there will be a separate high street foundation follow up to this post). The foundations I have chosen are Chanel Vitalumiere Aqua, NARS Sheer Glow, Clinique Redness Solutions Foundation and Yves St Laurent Le Teint Touche Eclat. 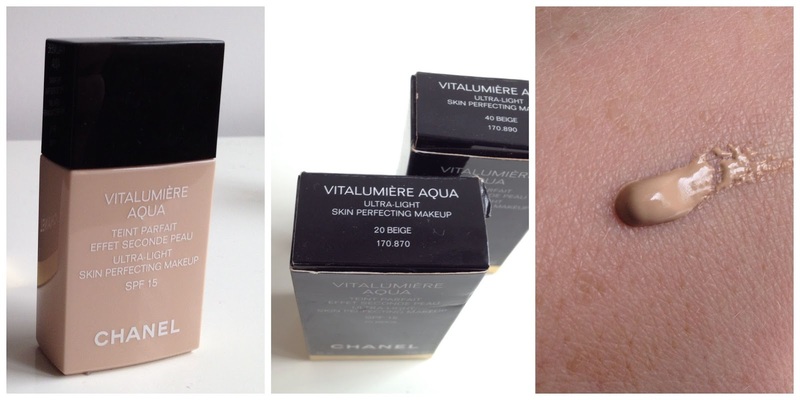 I have previously named Chanel Vitalumiere Aqua as my 'perfect foundation' (see my full review HERE). I do really like this foundation. It feels light on the skin but you can build coverage. It smells lovely and applies easily with a brush or your fingers. The bottle is basic but light and easy to transport. I find that the colour range is really good for my skin tone and it lasts ok through the day. As it wears through the day it just gently fades and doesn't leave patches or anything obvious but by the end of the day it has disappeared. You could of course touch it up really easily throughout the day if this was an issue for you. The only negative thing I can say about this foundation is that it is expensive. But in this case, you get what you pay for! A little goes a long way and the 30ml bottle lasted me for several months (I'm now on my third). I recently bought NARS Sheer Glow Foundation because I wanted to try a higher coverage foundation to even out that annoying winter red blotchiness that my fair skin is prone to. I had read good reviews and some even described it as a higher coverage version of Chanel Vitalumiere Aqua. I was excited! I found my shade match from looking on the amazing Findation.com and swatching it in store. But oh - I am so disappointed with this product. To start with the positives, NARS Sheer Glow has a really good shade range. Each shade is only slightly different so you really can find the best match for your skin. Also the coverage is much higher than Chanel Vitalumiere Aqua and the finish does have a nice dewy appearance to it. But after this it all went wrong for me. I found NARS Sheer Glow really hard to apply. I tried my fingers and my Real Techniques Expert Face Brush (review: HERE) but I felt a bit like I was applying emulsion to my face! You really have to use small amounts and build it up slowly otherwise it just sloshes around on your skin leaving streaks and brush marks. The biggest problem for me was that whilst it looked good once blended into my skin, over a couple of hours the foundation sank into my pores leaving my nose covered in tiny white dots of foundation. Believe me I tried 3 different primers which I usually find effective, but this still happened. I also felt that it tended to cling to any dry patches and just didn't give the 'flawless' finish I was hoping for. Overall this was an expensive disappointment to me. I bought it in the shade Deauville which for me is more suited to my winter skin colour rather than spring/summer so I will save it and try again in the winter in the hope it hasn't been a complete waste. I read a review that suggested a Miracle Complexion type sponge is the key to getting the application right, so perhaps I will try that when I revisit it. The moral of this story is don't spend a fortune on a foundation without getting a sample to try yourself at home for a few days (without the sales assistant egging you on to buy there and then). 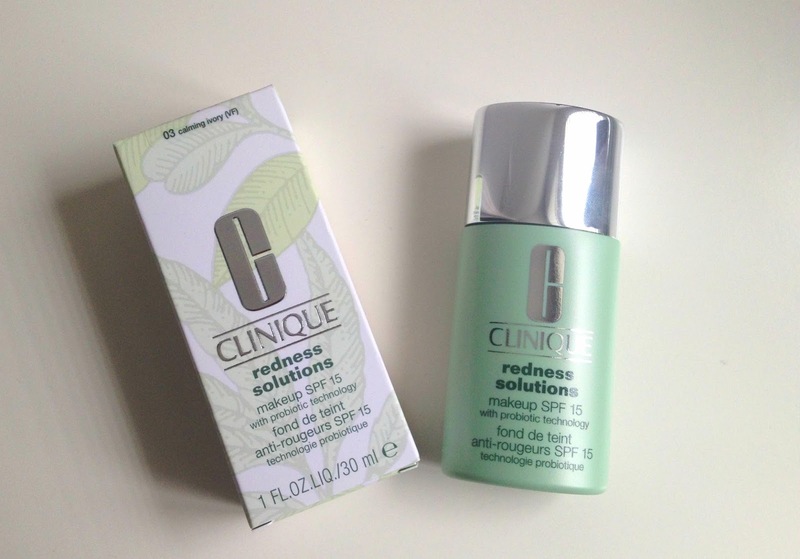 Next up in my experiment was the Clinique Redness Solutions Foundation. I was looking on the Clinique counter at their intriguing Pore Refining Serum (which I may still treat myself to). I explained to the assistant about my recent NARS disaster and she did a little make-over me starting with skin care right through to foundation. I was really impressed with the results! She had evened my skin tone and disguised my pores and blotted my shiny nose. Afterwards I sat in the sun all afternoon and despite the warm day the foundation and coverage was still perfect hours later. I returned to Clinique and asked for a sample of the foundation for me to apply myself at home (just to be sure this time!) and she gladly gave it to me. The generous sample has allowed me to try it for over a week and it was still really impressive. So of course I went back and bought the full size version! I was matched to the shade Calming Ivory, which is not the palest, and it does have a slight yellow/orange tone to it (to take out the red I assume). The coverage is quite high, but it applies and blends really easily. It has no fragrance and the bottle is a standard green plastic Clinique offering with a nozzle so you squeeze small amounts of product out without wasting any. Price-wise it isn't bad - at £24 it is two thirds of the price of the Chanel or NARS. It is a good foundation to have alongside my beloved Chanel as it offers higher coverage and colour correction for days when I need this. 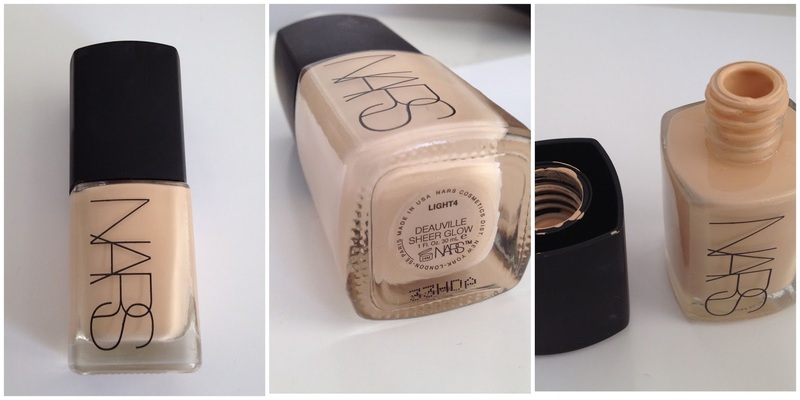 It wears well, mattifies and is the longest wearing of the foundations I tested. This is rapidly becoming a daily staple for me! My final high-end product is the Yves St Laurent Le Teint Touche Eclat Foundation* which I was lucky enough to be sent a small sample of. I of course already have the Touche Eclat Highlighter Pen and I had heard good things about the foundation version, so I was really keen to try it for myself. I was sent the shade BR30 - which according to Findation.com was my perfect match (based on my other foundation shades - you must try this website if you haven't already!). As soon as I tried the foundation I was really impressed, although it seemed quite runny it applied really easily and gave a great even coverage. I think it is really similar to Chanel Vitalumiere Aqua and apart from the lovely fresh cucumber type scent (vs Chanel's also lovely rose scent) I don't think I would be able to tell the difference. It lasts well throughout the day (again with no wearing off issues such as patches or those dreaded white pore dots...). According to the blurb Le Teint Touch Eclat Foundation doesn't contain the opaque powders that most foundations use, instead it contains a soft focus gel which avoids a mask type look. It also contains gold pigments to brighten shadowy areas and highlight features. 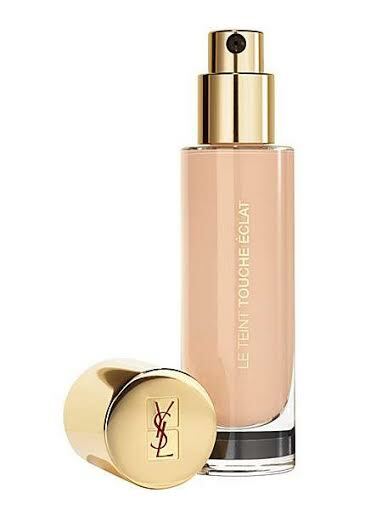 The Le Teint Touche Eclat Foundation packaging is an attractive glass bottle with a pump dispenser. The only thing that confuses me about this is the shade offering. You can buy rose tones (the R - Rose shades) or beige tones or warm tones of each of the shades. Luckily YSL have a really useful shade finder site which will guide your shade choice HERE. Shade BR30 matches me well but shade B30 is really quite yellow on me. Oddly though shade B40 is a much better match and safer bet moving into spring/summer when my skin will tan a little. I visited the Yves St Laurent counter and once again was given generous samples of both shades for me to try over a few days to make my decision. Again the price is over £30 so I wanted to be certain that I made the right choice! When my Chanel Vitalumiere Aqua runs out I may well give this one a go instead - they are so similar I don't really need both. It is worth pointing out that Chanel Vitalumiere Aqua is water based where as the YSL Le Teint Touche Eclat contains oils so if one doesn't work for you then the other one might! So now I have tested these foundations I can safely say that my favourites are Chanel Vitalumiere Aqua, YSL Le Teint Touche Eclat Foundation and the Clinique Redness Solutions Foundation. The Chanel and YSL give a really natural feel and appearance and the Clinique performs really well, evens skin tone and has the most staying power. Finally, very much in last place is NARS Sheer Glow Foundation - I have not managed to get this to work for me, so frankly I would save your money. Chanel Vitalumiere Aqua Foundation is £33, NARS Sheer Glow Foundation is £31, Clinique Redness Solutions Foundation is £24 & YSL Le Teint Touche Eclat Foundation is £30.50.